Membership in the Oregon Oldtime Fiddlers' Association is open to all who enjoy oldtime music. 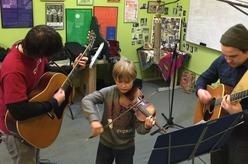 You don't have to be old or a fiddler! You don't have to play a musical instrument or sing! You don't even have to live in Oregon! Many members just enjoy listening to and perhaps dancing to our music! Membership entitles all in the household to participate in Oldtime Fiddlers activities.Annual membership is $20 per household ($25 if you wish the newsletter, The Hoedowner, to be mailed rather than sent via email). Clicking on the link below will display a form you can print. When you mail the form to us along with a check for your annual membership dues, you will become a member of both the state organization and of your local district. Click here to display a membership form. Complete it, print it, and mail it to the address on the form along with your check for the annual dues. If you would also like to order a member's badge, click badge to request a member's name badge. Our website has a link to the current issue of the state association's monthly newsletter, The Hoedowner and a link to an archive of all past issues since the association's inception in 1966. Each issue has articles describing activities in each district of the state including those in your own district. At the top of each district's news are the district officers including their contact information. You may wish to contact the appropriate officer in your district to insure you are placed on the email list so that you receive late-breaking updates. We look forward to having you join us.